One Owner Custom in Fenwick! Upgrades! 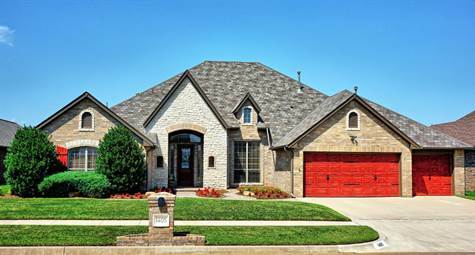 Fenwick Gardens, Edmond - Beautiful Custom One Owner w/ lots of upgrades! 2 master suites or 2nd living with attached full bath and walk-in closet, walk-in closets w built-ins in each room, 4'' wood shutters thruout, separate office, spacious kitchen w/ plentiful storage and walk-in pantry, granite & solid surface countertops, island, crown thruout, linen storage everywhere, large covered patio, backyard backs up to greenbelt, built-ins in living & office, sprinklers, intercom/security system, surround sound in living and on back patio. Ceiling Fans thru-out, mature landscaping, 3 car spacious garage, backyard open to greenbelt, neighborhood pools and recreational facilities, tile & carpet, island, wine rack & double ovens in kitchen, all walk-in closets have built-in storage, stained wood trim and cabinetry, walk- in lighted pantry, oil rubbed bronze fixtures and hardware, beamed ceiling in kitchen, large eat-at bar, tall windows, 4 burner gas stove, masonry split block fireplace w/ gas log insert, built-in shelves and entertainment in living room, built-in shelves in office, master suite offers an oversized jetted tub, separate large shower, walk-in closet with built-ins and floor to ceiling storage, double sinks, make-up vanity area, and medicine cabinets hidden behind the mirrors, hand-stained wall finished thru out. Edmond school district!